Son of a former running back for the Jets of the same name (his brother Dominique also played in the NFL as a safety with the Houston Texans), Barber teamed up with RB Laurence Maroney in college to create an effective tandem. He gained 4495 all-purpose yards, 3276 via rushing. Barber entered the 2005 NFL draft after his junior year and was chosen by the Cowboys in the fourth round. Backing up RB Julius Jones, he rushed for 538 yards and five touchdowns as a rookie. With his ability to break tackles, Barber proved to be a good complement to the injury-prone Jones and became the preferred short-yardage runner in a two-back arrangement. Cowboys went 9-7 to finish second in the NFC East and qualify for the postseason as a Wild Card while leading the conference in touchdowns (52). Lost NFC Wild Card playoff to Seattle Seahawks (21-20). Barber continued to be used in combination with Julius Jones in 2007 and rushed for 975 yards and 10 TDs while also catching 44 passes. He was selected to the Pro Bowl and, with the departure of Jones, moved into the starting lineup in ’08. Still a potent power runner, he was also bothered by a toe injury and, rushing for 885 yards, his yards-per-carry dropped from 4.8 to 3.7. Still, he achieved a career high with 52 pass receptions for 417 yards and scored a total of nine touchdowns. 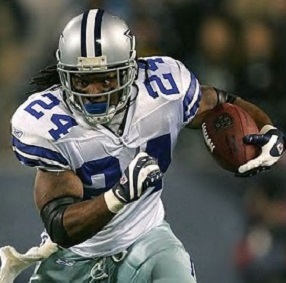 Barber ran for 932 yards in 2009 but showed signs of wear and RB Felix Jones saw more action. The toll taken by his hard-charging running style caused a quick drop in Barber’s production in 2010 as his rushing total fell to 374 yards and his career came to an end as a backup with the Chicago Bears in 2011. Overall, Barber rushed for 4780 yards and 53 touchdowns on 1156 carries (4.1 avg. ), with 4358 of those yards and 47 TDs coming with Dallas. He also caught 179 passes for 1330 yards and six more TDs.